A sweet and sour sauce derived from the pulp of the tamarind fruit; a key component in Worcestershire sauce and pad thai sauce. "Tamarind" derives from an Arabic word meaning "Indian date." This plant grows wild in Sudan but is also known for thriving in India and Mexico. It best performs in humid, tropical climates. 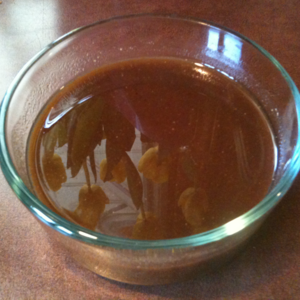 Tamarind paste becomes sweeter as it ripens. When immature, however, it is very sour. While this tartness may be unappealing on its own, it adds great flavor to savory dishes like meat stews and curries. Tamarind has an excellent nutrition profile, as well. It is high in B vitamins, calcium and tartaric acid (an antioxidant that neutralizes free radicals and gives tamarind that sour taste). Beyond its nutrition, tamarind is also useful for making metal polish, furniture, and hard wood floors. It has also traditionally been utilized medicinally- especially as a poultice for fever.